A unique exhibition featuring 11 paintings of St John Paul II is being held at the APS Bank Centre in Swatar until October 8. 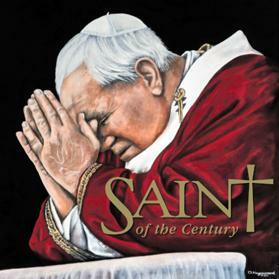 Titled Saint of the Century, the original paintings are the work of renowned artist Don Heywood. Mr Heywood’s illustrious career includes various works of art commissioned by the Wimbledon Lawn Tennis Club and Community Rights Counsel, among others. Such works of art comprise a life-sized portrait of Queen Elizabeth II in Buckingham Palace and the Smithsonian Endangered Species Collection. The exhibition features seven oil paintings and four pencil drawings, all portraying St John Paul II’s compassionate side, which people admired him for. APS chairman E. P. Delia said the bank is providing the public with the rare opportunity to view the paintings in one place. “These paintings capture the essence of a great man, whom most of us have had the privilege of getting to know along his distinguished papal years. Pope John Paul II lives through numerous recordings of speeches and moments that have shaped the Church. When looking at the paintings, one can’t avoid feeling the strong connection, almost at personal level, Pope John Paul II managed to build with the people of all faiths,” said Mr Delia. The exhibition has been set up to coincide with the launch of the book Saint of the Century, which features the collection of the artist’s 29 paintings and drawings of Pope John Paul II, published by Miranda Publishers and sponsored by APS Bank. The art pieces, photographed by photographer Kurt Arrigo, are accompanied by 38 quotations made by Pope John Paul II during World Youth Days between 1985 and 2002. “Although perhaps better known for the large format coffee-table books with which we have become synonymous, the strong connection between St John Paul II and the Maltese islands is something we wanted to capture in literary form. The book is meant to be a testimony to the great life he led and the reasons behind Heywood’s artistic process of capturing this through his art,” said Tony Aquilina, managing director, Miranda Publishers. Opening hours are from 8.30am to 1pm, Monday to Friday, and from 8.30 to 11.15am on Saturdays.